You are currently browsing the tag archive for the ‘Martinique’ tag. 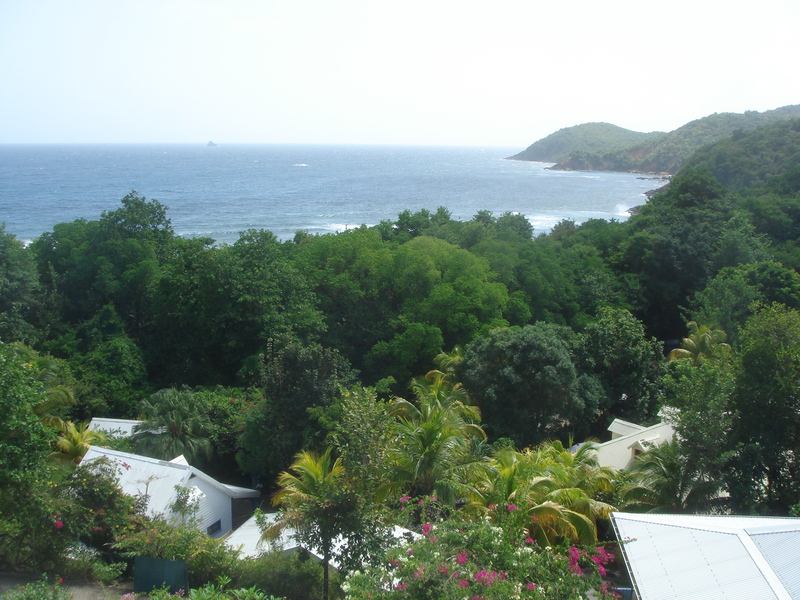 I knew ahead of arriving that Martinique, a 128-square-kilometer island in the Lesser Antilles, would be quite French. It’s an official overseas department, it uses the Euro and its favorite sport is not cricket. Still, it’s a bit of a shock to see how French the island actually is. 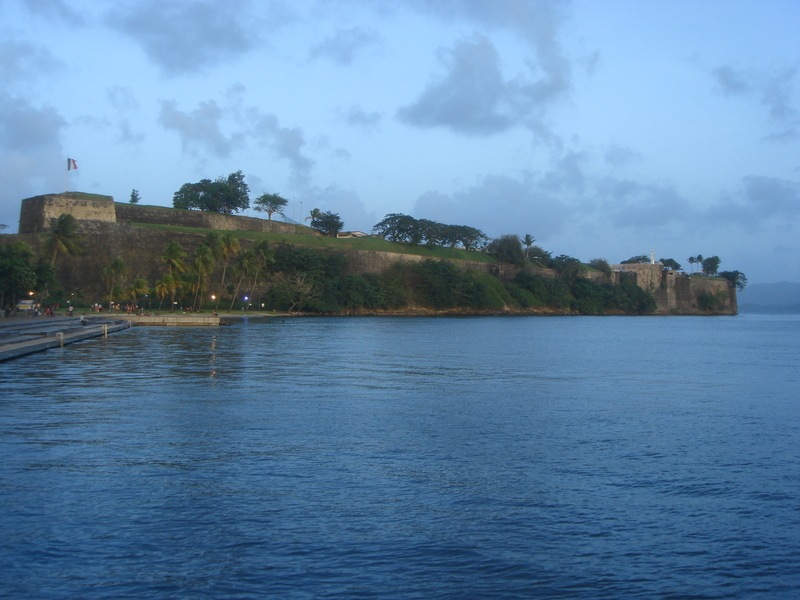 The actual fort that Fort-de-France is named after. It’s still used by the French navy as a base today. We arrived in Fort-de-France, the capital, named after the seventeenth-century fort that dominates the port and is still being used by the French navy, after a nine-hour flight from Paris. Driving downtown from the airport we passed a Carrefour, an Intersport, a Franprix and all the other retailers from the mainland. Not all that is French is popular, though. Josephine, Napoleon’s first wife, who was born on the island is widely blamed for prolonging slavery as a ways to keep the family plantation going. They beheaded her after the fact. 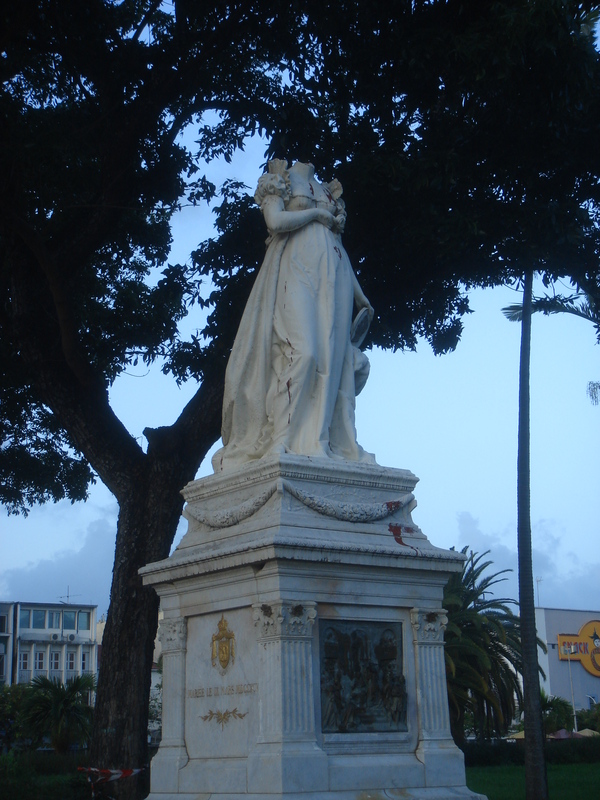 Beheaded statue of Josephine in the city’s main park. The city itself has a nice little center of small shops, bars and restaurants along the waterfront, where the island ferries pick up and drop off passengers. There is a beautiful library, shipped over in pieces from the Paris Exhibition, and a impressive cathedral in the centre. We had breakfast in a small cafe where they served coffee and stale croissants. Most of the locals seemed to be eating large baguettes with ham, cheese, chicken and other fillings, leaving the pastries to wilt in the display. Schoelcher Library. Taken apart and sent by ship from Paris to Martinique. 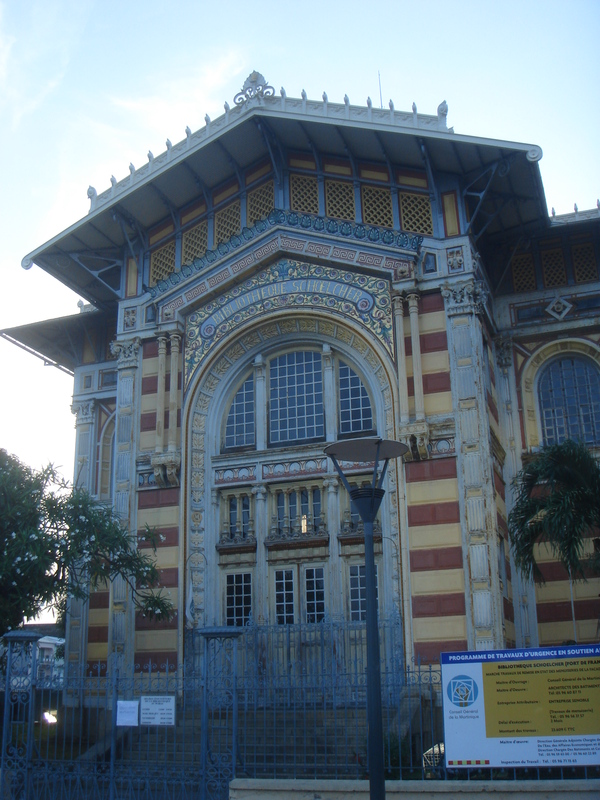 We spent a day in Fort-de-France, and then rented a car to see the rest of the island. The roads are very well maintained and in no time we reached the former capital of St Pierre, which was burried by the eruption of a nearby volcano in 1902. Ironically, the only person to survive it was a slave who had been put in solitary confinement in a very sturdy prison cell. He went on to tour with the Barnum & Bailey Circus. Ruins of the 700-seat theatre destroyed by the Mount Pelee eruption in 1902. We then crossed the island, passing through rain forests to reach the Atlantic coast. 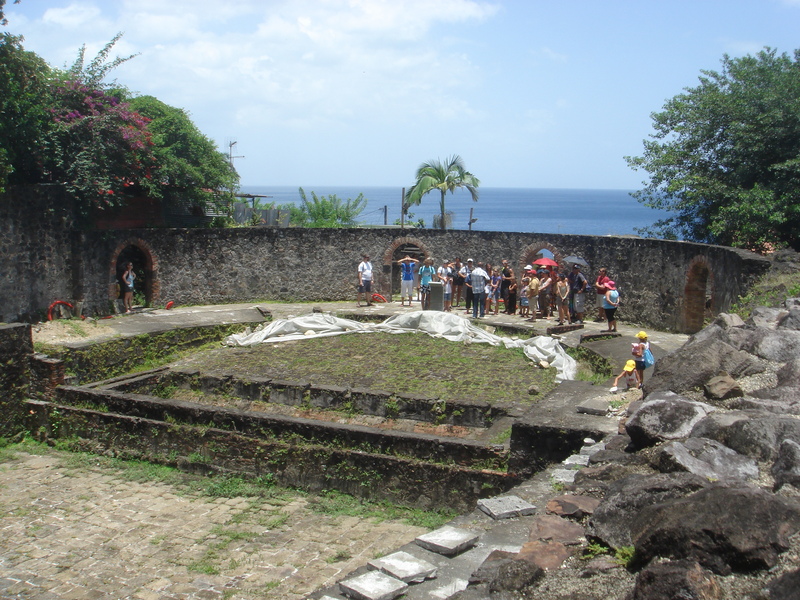 Over the next few days we mostly relaxed, listening to the crash of the sea from the balcony of the small studio we rented, and visiting an old rum distillery and nearby plantation ruins. At night, the heat would dissipate a little, and a deafening chorus of chicadas, frogs and other insects would rise. View on the Atlantic from our hotel on the Caravelle Peninsula. As we drove back to the capital to catch our ferry to St Lucia, we passed a couple of old men standing by the beach in shorts, colorful shirts and flip-flops, playing a game of petanque. One of them had a fresh baguette under his arm as he looked on from beneath a palm tree.